Plus freight, setup, $79.00 doc fee, tax, & DNR registration. 3000 Engine: The 700cc 4-stroke EFI engine combines sufficient power with clean technology and incredible fuel efficiency, earning itself a place in the Arctic Cat® engine lineup. It’s compact. It’s lightweight. And thanks to electronic fuel injection, throttle response is immediate. Work or play, this 4-stroke is raising eyebrows across the snowbelt. 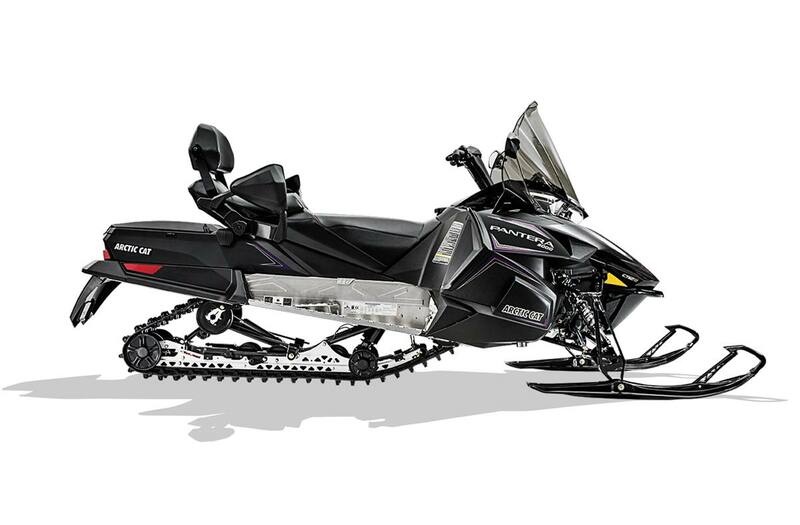 Arctic Drive System with Arctic Cat Clutches: The Arctic Drive System™ features a lightweight magnesium chaincase. The Arctic Cat® clutch system engages at lower RPMs without sacrificing top speed. SLIDE-ACTION Rear Suspension with Arctic Cat IFP Shocks: Our SLIDE-ACTION Rear Suspension incorporates a U-shaped front-arm slot that fits over a shaft bolted across the tunnel. This creates a half-inch of sliding movement, which keeps the front arm from torque locking and helps keep the skis planted during acceleration. Add in our Arctic Cat (IFP) shocks and you’ve got comfort and confidence even in the bumpiest conditions. Heated Driver's Seat: With our heated driver’s seat, you stay warm and comfortable even on long rides. ProTour - 6 Skis: 6" wide plastic skis deliver excellent handling on hard-pack conditions and great flotation in loose snow. A stiffer and deeper keel provides more positive cornering in all conditions. Passenger Wind Deflectors: Cold wind and hands don’t get along. These will help deflect that wind to keep your passenger’s hands nice and warm. Rear Compartment Storage: Whether it’s water, snacks or gloves, here’s a good place to store it. The compartment also includes a belt holder so your spare belt is always secure and out of the way. 17" High-Height Windshield with Mirrors: The extra-high windshield tames the wind out in the great white open, while the mirrors make backing up easy as ever. Side Panel Wind Deflectors: So simple, yet so effective. These deflectors push cold air out and around both you and your passenger to help keep you comfortable out on the trail. Visor Plug-ins: If you’ve got a heated helmet visor, we give you the outlets you need to plug in and get rid of that visor fog.